Take A Big Gulp, People, It’s Fun Being Clinically Obese! 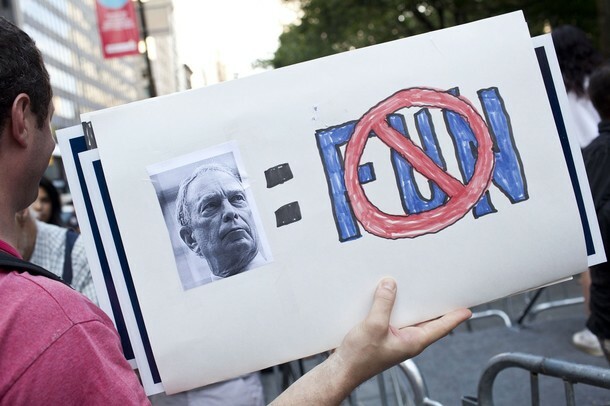 This placard is part of a protest against New York Mayor Michael Bloomberg’s plans to restrict the sale of sugary drinks in containers larger than 16oz in delis, fast-food franchises and sports arenas. It doesn’t extend to beverages sold at 7/11s and other grocery stores though. Just to be clear, 7/11’s Big Gulp range is currently offered in the following sizes: Gulps (20 oz) Big Gulps (30 oz), Super Big Gulps (40 oz) and Double Gulps (50 oz). The 64oz cup used to be the largest size available, but was reduced to a 50 oz cup when, according to the New York Times, customers complained it was “too difficult to carry“. Seems a shame really. Arguably if 7/11 had listened to what their customers were saying, they would have kept the 64 oz on their beverage list and added the 128 oz (6.4 pints, fact fans!) cup. The weight of the damn thing might have gone a little way to offset the 1500 calories it would contain. No fun in that though, is there?